Nice...what size lift and tire? 1972 3 door, Just back from paint and body. Still working on the interior. Looks good Jim. Real medium Olive or a modern equivalent? It’s a custom mix, more of an emerald green. Just brought this home, now the headaches begin. Last edited by Gumby61; 03-26-2019 at 06:24 AM. Looks like a pretty nice starting point, Gumby61! I almost traded my Harley for that Suburban.... Make sure you start your own build thread and document with pictures. They are a great reference down the road. My new 1970 K20 on a recent trip to Glacier Park. I like the painted grill surround. Did you do it yourself? I did not. Bought it that way. I am guessing oneleglance was the one who did it as it is his old Burb. 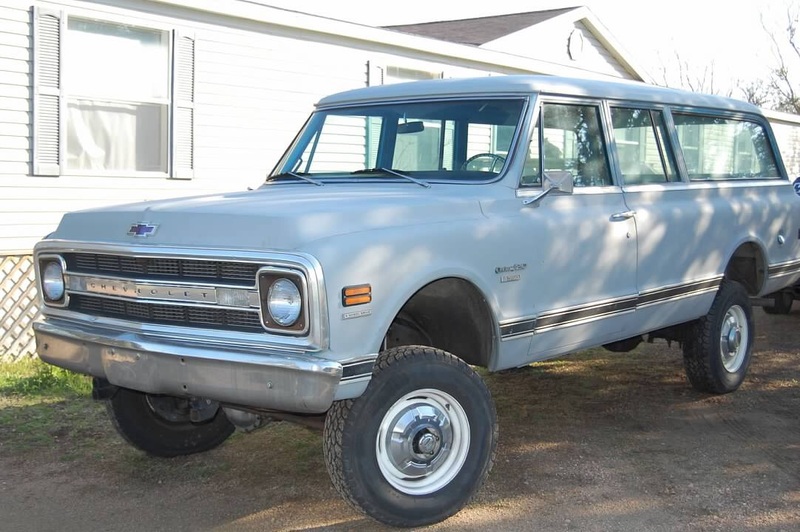 In the middle of building a 32x36 shop so i wont get much done on it for a while but once the garage is finished, this big ole turd is going to get some much deserved TLC 1970 1/2 ton 4x4 suburban. barn doors, 4 spd still rocking her original paint and all the original panels. could you please post a closer grill shot? I like that a lot, thank you!